MUST READ !! 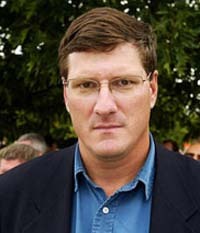 : Interview with Scott Ritter : "Neo Cons are Parasites"
Read here full interview transcript by Larisa Alexandrovna, in Raw Story. This is the third of Raw Story's series of conversations with former U.N. weapons inspector Scott Ritter. In the first installment, Ritter spoke about the situations as regards weapons in Iraq, Iran and Russia. In this final part of the three-part series, the former weapons inspector details his beliefs about the neoconservative movement, the American legislative process and his hopes for the future. Larisa Alexandrovna (LA): Paul Wolfowitz stated prior to the Iraq invasion that Iraqi reconstruction would pay for itself. It seems that Mr. Wolfowitz, now charged with handling the World Bank, miscalculated. What is going on with the oil in Iraq? Paul Wolfowitz was a salesman; his job was to sell a war. He acknowledged this in an interview with Vanity Fair magazine, in which he acknowledged that WMDs and the threat they posed, was nothing more than a vehicle to sell this war to America. Now you [get] to the war itself and selling it to Congress and [the] questions: How long will this take? Or how much will this cost? Paul Wolfowitz lied to Congress about the costs of war. There is not a responsible member of government who thought this would be quick and cheap. There was nobody who believed that Iraq oil would pay for itself, no one in the oil business thought so. LA: What about oil companies, were they for the war or against it? No oil professional in their right mind would support what is happening in Iraq.This isn't part of a grand 'oil' strategy; it is simply pure unadulterated incompetence. LA: So they are concerned about their bottom lines, and chaos doesn't forward that goal. Right. Oil company executives are businessmen and they are in a business that requires long-term stability. They love dictators because they bring with them long-term stability. They don't like new democracies because they are messy and unstable. I have not run into a major oil company that is willing to refurbish the Iraq oil fields and invest in oil field exploration and development. These are multi-billion dollar investments that, in order to be profitable, must be played out over decades. And in Iraq today you cannot speak out to projecting any stability in the near to mid-future. LA: OK, so now to Congress. They approved the war. I know we have discussed the post-9/11 reality and the pressure of not seeming unpatriotic. Yes, but they also approved the war because Congress had been locked into a corner by the neocons in 1998. Our policy in Iraq since 1991 has been regime change. Bill Clinton inherited this policy of regime change, but the Bush policy was not an active policy, it was a passive policy to strangle, as it were, Saddam. It was not our policy to take him out through military strength. Saddam, however, was able to out-maneuver this policy, he did not get weaker he got stronger. The neocons played on the political implications of this, to box the Clinton administration and Congress into a corner. When you declare Saddam to be a threat with WMDs and then do nothing, you have a political problem. The neocons played on this. In 1998, the Heritage Foundation, Paul Wolfowitz and the American Enterprise Institute basically drafted legislation [that] became the Iraq Liberation Act. This is public law. So when people ask why did Congress vote for the current war in Iraq, it is simply that they had already voted for it in 1998, they were trapped by their own vote. LA: So your implication is that in our current foreign policy the neocons have set the tone via thinktanks or supposed thinktanks? Yes. Look at who funds the American Enterprise Institute, and the Heritage Foundation, and I think you'll have your answer. LA: What do you think these institutions are trying to achieve? I know the public claim is conservative values, but there is a some speculation regarding what appears more like Leninist, even Trotskyite values, especially given the current domestic government involvement and control or attempt at control of almost every facet of society, economy, family, etc. Even the term 'Leninist' was used by the Heritage Foundation to describe their approach to Social Security during the 1980s (read it here – PDF). LA: And what of Karen Hughes' appointment? Hughes – she is a salesperson; she will sell the policy. She is irrelevant. She is nothing. Her appointment means nothing. Rice has already capitulated to the Pentagon and the White House, and Hughes' appointment is but a manifestation of that larger reality. They build nothing. They bring nothing. They don't have a foundation. They don't stand for business. They don't stand for ideology. They use a host to facilitate and grow their own power. They are parasites that latch onto oil until it is no longer convenient. They latch on to democracy until it is no longer convenient. LA: Rice's appointment to the State Department is simply to reshape it into a neocon vehicle.Why the State Department? Why Rice? The State Department still has free thinkers in it. Rice is a dilettante. Anyone who was there during the Reagan era and her advising on Soviet policy knows how inept she is. She is NOT there because she is a brilliant secretary of state. The media has bought into this, because the neocons cleverly put a woman, an African-American woman at that, into this position. So when Rice goes abroad, people do not look at the stupid things she says, they look at what she was wearing and such. LA: So you believe the neocons are elitist parasites? Yes, elitism is the perfect term. LA: Do you consider it localized or global elitism? The neocons believe in what they think is a noble truth, power of the few, the select few. These are godless people who want power, nothing more. They do not have a country or an allegiance, they have an agenda. These people might hold American passports, but they are NOT Americans because they do not believe in the Constitution. They believe in the power of the few, not a government for or by the people. They are a few and their agenda is global. LA: You suggest the Republican Party is simply an organizational host. Is there any vestige left of the host or has the entire party been devoured? The Republicans have been neutered by the neocons. LA: Your concept of neocons seems confusing because, using your host/parasite paradigm, they cannot tell between the host and the parasite which invades it. I know people who have worked for George H. W. Bush, both when he was vice president and president. I think it is dangerous to confuse the two, because there are Americans who love their country and are conservatives who do not support what is going on. Until the host rejects the parasite, it is difficult to separate the two. Brent Scowcroft for example is not a neocon, yet people call him one. Scowcroft worked hard to reign in the 'crazies in the basement,' as did Reagan. LA: Many have defined the neocon movement based on the highly intellectual, albeit warped, musings of Strauss and Bloom. Yet one could hardly call the current leadership intellectual or even capable of digesting this philosophy. Even neocon thinkers are jumping off the ship. Do you believe this is simply trickle-down Machiavellianism in much the same way that Communism trickled down as an aberration of its original intent? ideology was always hypothetical in its pure application until now. What we are seeing today is what happens when theory (bad theory at that) makes contact with reality. You get chaos, through which the neocons are now trying to navigate. LA: Is Karl Rove a neocon? Karl Rove is not part of the neo-conservative master group; he is a host. LA: Then who is steering the ship? An oligarchy of 'public servant' classes who are drawn from business, and serve naked economic interests. This is true whether you are Democrat or Republican. LA: Several insiders have expressed concern over possible oil shortage riots. Would the Patriot Act be put to use, in your opinion, to address such riots? [The Patriot Act] is simply the neocons putting their judicial agenda in place by other means. It was a compilation of all of the conservative initiatives, not neocon initiatives, which the conservative Republicans have been pushing for, including a more conservative law enforcement element. This is not unhealthy as long is it is done properly, through legislation, proper channels of debate and discourse. A lot of this had been submitted in the past, but was rejected. After 9/11 all of these initiatives were lumped together. There are some things in the Patriot Act I agree with, but the Patriot Act requires a responsible society. The neocons have no interest in a responsible society; they simply used the conservatives as a vehicle to push an agenda to assault individual civil liberties. As the Patriot Act is now, how it came about, is entirely un-American. It is extreme legislation that does nothing to address the issues it professes to, but moreover, it is, as an existing law, un-American. What makes it un-American is that no one read it before they voted for it. So the process was un-American, and the motivation behind it was un-American. We cannot have a nation that is governed by fear. The Patriot Act is un-American simply because it exists. LA: So how do citizens address this situation since the very means of addressing it via Congress seem to have been closed off? They are already in control. If the people want to heal this country, the people have to purge the failing of this country. Vote them out. It might take two or three cycles, but it will happen and it will take time. for the Patriot Act needs to go because they did not represent the people by voting on legislation they did not read. They have to go, regardless of party. They have through their actions decided who stays and who goes. LA: You suggest Americans vote out all who voted for these measures. If New Yorkers voted out Hillary, who voted for both the Patriot Act and the war in Iraq, and who is also leading the pack of the Democratic Party for the 2008 nomination, what then? Hillary is the manifestation of all that ails the Democratic Party. She stands for nothing. She has been compromised by her voting record ... how can she stand for anything worth supporting? Like I said, it might take two or three cycles, but it will happen. Dean has to be part of the process of rebuilding and that will take time. Dean cannot run for president, because Dean cannot run as a Democrat – the party is not set up to sustain someone like him. He is one of the exceptions in a corrupt party. He is also not corrupted by his voting record. He is someone who represents something, he did not vote for the war in Iraq, for example. LA: We talked about this current social crisis as a closed loop during the second installment. Have you ever seen a loop like this throughout the history of the U.S.? What does this mean? The American experiment is much too complex to be destroyed by the neocons. In the end, the neocons will lose. It may take ten to twelve more years, and the costs will be horrific, but America will survive. There will be one hell of a mess to clean up, though, after the fall of the neocons. LA: Where do you see America, should things continue as is, five years from now? At war, bankrupt morally and fiscally, and in great pain ... and only half-way through. Ten to twelve years is what we will have to get through, but we will get through it. 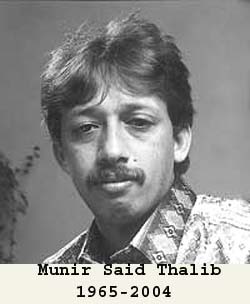 Read here full article "Police Probe Garuda Link to Munir’s Murder"
Police say they will investigate allegations that national airline GARUDA Indonesia was involved in last year's murder of outspoken human rights activist, Munir Said Thalib. Munir was born in 1965 and was active on human rights issues even as a law student. After obtaining a law degree from Brawijaya University, he worked for the East Java Branch of the Indonesian Legal Aid Foundation (YLBHI), and during the 1990s was legal counsel for a number of victims of official violence and repression. He now leads YLBHI's operational division. Munir (38), founder of the Commission for Missing Persons and Victims of Violence (Kontras) and the Indonesian Human Rights Monitor (Imparsial), died of acute arsenic poisoning in September while on Garuda Flight GA-974 from Jakarta to Singapore to Amsterdam. Dutch authorities conducted an autopsy that revealed 465 milligrams of undigested arsenic in Munir's stomach - more than double the normally lethal dose of 200 milligrams. The government-backed fact-finding team, which consists of rights activists, lawyers, and police detectives, on Thursday said there were indications that Garuda officials were involved in Munir’s death. The team accused Garuda of violating an international aviation law because airlines are required to investigate any deaths that occur during their flights. "There are strong indications that Garuda's employees were directly or indirectly involved in Munir's death. There is hard evidence that the murder of Munir is a conspiracy. There is no way it was committed by individuals." Garuda President Director Indra Setiawan. Setiawan was alleged being involved in the conspiracy because in his initial statement to police he denied ever meeting Pollycarpus, but later told the fact-finding team he knew the pilot. Local media reports have pointed to a Garuda pilot, Pollycarpus Budihari Priyanto, who has alleged links to military intelligence and convinced Munir to change his economy class seat for a business class seat. Initial reports said Pollycarpus was off-duty at the time of Munir’s death, but Garuda later claimed he had been assigned to serve as an aviation security officer on the first leg of the flight. Another member of the team, rights activist Asmara Nababan, said the team doubted a claim by state-owned airport management firm PT Angkasa Pura that it did not have closed-circuit television (CCTV) footage of the time Munir was at Jakarta’s Sukarno Hatta International Airport on the night of September 6. "There are 700 spots covered by CCTV at the airport, which are handled by two operators, so how come they said they did not have the tapes? It's either that management at Angkasa Pura and Garuda is extremely poor, or that they are part of the conspiracy," he was quoted as saying by the Jakarta Post. Hanafi has advised the National Police to question the management of Angkasa Pura over its poor surveillance. Munir’s colleagues have said Pollycarpus is no ordinary pilot but may be a covert operative for the State Intelligence Agency (BIN). Their investigations have revealed that he piloted flights - ostensibly for Christian missionaries - in Irian Jaya (now Papua) province over 1985-87 when the military was attacking separatist rebels in the territory. Pollycarpus later flew planes to evacuate Indonesians from East Timor in 1999 after the military and its militia proxies unleashed carnage there in response to the territory’s vote to secede from Indonesia. East Timor’s notorious former militia leader Eurico Guterres, who has close links to senior generals, has admitted to knowing the pilot. Suspicion has focused on Pollycarpus because he allegedly telephoned Munir’s house two or three days before the activist left for the Netherlands. He allegedly told Munir’s wife Suciwati he would be on the same flight as her husband. The pilot has denied calling Munir’s house and insisted he was not involved in his death. He also denies any links to military intelligence agencies. Rights activists have said they suspect BIN issued Pollycarpus a gun license. It has been established that Pollycarpus introduced himself to Munir and Suciwati when they arrived at Sukarno-Hatta on the night of September 6 - although Angkasa Pura claims it has no CCTV footage of the three meeting at the airport. Munir was carrying an economy class ticket when he boarded Flight GA-974, but Pollycarpus persuaded him to take his business class seat. The pilot then took a seat in first class. During the Singapore-Jakarta leg of the flight, Munir ordered and consumed noodles and orange juice, while Pollycarpus was reportedly seen pacing nervously between the bar in first class and the cockpit. When the plane arrived at Singapore’s Changi Airport at 11.40pm Jakarta time, Munir went to the waiting room, while Pollycarpus left the airport. At 12.50am Munir re-boarded the aircraft and this time sat in his economy seat. Within a few hours he was in agonizing pain and suffering severe nausea and diarrhea. He died at least three hours before the plane landed in Amsterdam. Read here "Interview with Martin van Crefeld by the Dutch magazine Elsevier " Professor Martin van Creveld is an internationally known professor of military history at the Hebrew University in Jerusalem. "Israel has no choice but to withdraw from the West Bank - not to indulge the Palestinians but to save itself." Do the Israelis seem remotely interested in giving this up? If your answer to both is negative, then you share my view that we should not be deceived into optimism by a pitstop in mutual vilification between Ariel Sharon and the Palestinian Authority. The key challenge now, as ever, is to convince Israelis that their own security interests are best served by evacuating the Occupied Territories. And this does not mean getting out of Gaza merely in order to strengthen Israel's grip on the West Bank . These issues are addressed in a new book by Martin van Crefeld, who was born in Holland but has lived in Israel for much of his life, and is an internationally respected military historian and strategic guru, even if also a prophet somewhat disdained in his own country. His book, published in the US (but for which he could find no Israeli, or British, publisher), makes a powerful argument for Israel's withdrawal, not to indulge the Palestinians, but to save itself. He believes unilateral action is essential, because the Palestinians will never become viable partners in a bilateral deal. He accepts that some terrorism will continue anyway, and thus proposes that Israel should shield itself with a security wall established on its pre-1967 frontiers. He acknowledges that most Arab states will remain irreconcilably hostile, which means that Israel must maintain stringent security measures to protect its people from harm. But he believes these must be based upon internationally recognised borders, because to sustain Israel's explicitly expansionist policy of the past 25 years has become intolerable militarily, financially and diplomatically. No amount of neo-conservative encouragement from Washington, such as the Bush administration offered last week for Israel's West Bank settlements, can change this. Hawks who argue that Israel's security demands a buffer zone beyond its borders are living in the past. In the new age of military technology, Israel's superiority over the Arabs will increase. Iraq is out of the reckoning as a foe. Syria, Egypt and Jordan can't look to US or Russian patronage to build new conventional arsenals - and the conventional threat to Israel is now almost non-existent. Weapons of mass destruction are another matter. The only credible defence against an Arab state will always be deterrence, perhaps eventually supported by an anti-missile system. For all the Arabs' extravagant rhetoric, self-interest will dissuade them from launching a nuclear strike against Israel when they can be sure of an annihilating response. The key to defusing Jewish settler militancy, Van Crefeld argues, is a guarantee of alternative housing. Most of the 200,000 people who have gone to live beyond Israel's borders have done so not as eager colonists, but because the West Bank offers affordable homes. If they are promised accommodation in Israel as part of a deal, the government will have to deal only with a small minority of madmen, who are convinced that Israel has a divine claim on biblical Israel. He suggests that, after withdrawal, Israel should scrap most of its conventional forces and adopt much more effective, and less manpower-intensive, technology-based defences: balloon- and drone-mounted surveillance devices; beyond-smart, so-called "brilliant" missiles; and unmanned aircraft. If it rejects withdrawal, if it seeks to sustain its strategic roads and colonial settlements in the West Bank, then it faces an eternity of debilitating and unwinnable counter-insurgency, "which opens the door for vandals, thieves, extortionists, sadists and perverts of every kind [in the Israeli army] to realise their fantasies at the expense of the hapless population". From October 2000 to June 2003 alone, 360 Israel soldiers were put under investigation, an average of two a week, including 153 cases of suspected homicide. Those figures ignore countless cases that went unreported. Withdrawal will eliminate "by far the most important source of friction between [Israelis and Palestinians], namely the occupation itself". A comprehensive wall protecting the new frontiers will cost at least £500m, possibly more than double that. But the occupation has already cost at least £10bn, so a wall will be cheap at that price. Van Crefeld rejects the strategy of seeking to negotiate piecemeal "concessions" with the Palestinians. There is no goodwill left to work with. "After years of bloody repression ... Partly to be on the safe side, partly to please Israel's hawks, the working assumption should be that the hawks are right ... Israel should seek to rid itself of as much Palestinian ballast as possible. Once this is done, the remaining threat can be dealt with by military rather than political methods." Martin van Crefeld is, in Israeli terms, a maverick and even close to an outcast, but only the Likud would readily dismiss him as a fool. Most of what he says reflects a lifetime as a respected, sometimes brilliant, strategic analyst. Today, few Israelis will heed what he says, because most of those who claim to want peace in truth want victory. They still cannot reconcile themselves to abandoning the West Bank, less still East Jerusalem. Yet I suspect that reality will prove to be on Van Crefeld's side, even if the timeframe is very protracted. Sooner or later, Israel will have to recognise that the cost of occupying what other nations, almost without exception, recognise as legitimate Palestinian territory is intolerable. Attempts to institutionalise illegal occupation, by placing chunks of unilaterally annexed territory behind Sharon's fence, will ultimately fail. Even if few Israelis today think rationally about these things, we should welcome the fact that one of them is doing so. Residents searched through smoldering rubble for survivors on Indonesia's Nias island Tuesday, and relatives wept over the bodies of the dead after an 8.7-magnitude earthquake hammered the region, triggering a tsunami scare. An overflight of Gunung Sitoli, the island's biggest city, indicated about 30 percent of its buildings were destroyed, and there was significant damage in the island's second biggest town, Teluk Dalam. The quake damaged Gunung Sitoli's airstrip and prevented all but small planes from landing. The Indonesian military flew The Associated Press and other news organizations over the island to inspect the damage. 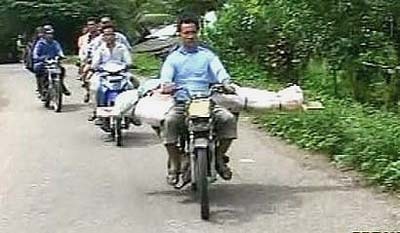 Fishing villages along the coastline and inland appeared to be largely unaffected. In Gunung Sitoli, people could be seen digging through the rubble as smoke from burning buildings hung in the air. A steeple had been knocked off a church on the mainly Christian (Nias) island. A soccer field was turned into a temporary relief center. People swarmed around U.N. helicopters as they landed to deliver relief supplies. The International Organization for Migration said it was sending trucks loaded with water, milk and other food items, and medical supplies to the Sumatran port town of Sibolga, where they will be ferried to Gunung Sitoli. Japan and Australia offered to send troops to Nias to help with the cleanup if Jakarta asks. India pledged $2 million in aid. U.S. officials promised rapid assistance. UN relief agencies say their aid effort in Indonesia following December's tsunami disaster was well-funded and they are unlikely to need more cash after the latest quake in the region. Representatives of three Geneva-based agencies and the International Federation of Red Cross and Red Crescent Societies say staff are already moving to the newly-affected areas and food and medical supplies are on the way. "There should be NO problem with funds. We received enough support for the tsunami appeal," Christiane Berthiaume of the World Food Program (WFP), said. OCHA, the WFP, UNICEF and the non-UN International Organisation for Migration all say they are sure they can cope with the new disaster with what they had in place in Indonesia already. A three-metre-high tsunami struck Simeuleu Island near Aceh minutes after the huge earthquake that struck off Indonesia's western coast, Kyoto and Agence France-Presse news agencies reported. And the fate of around 5000 people living on isolated islands close to the epicentre of the massive earthquake remains unknown, as aftershocks continued to rattle Sumatra today. According to an Aceh-based journalist who made contact with the island, the main hospital in Sinabang had been destroyed and could not be used.He said there were unconfirmed reports of 25 dead on the island. Earlier today there were reports only of tsunamis running to 25cms high, leading experts to express their bafflement as to why last night's quake had not generated a larger tidal wave as in the Boxing Day disaster. 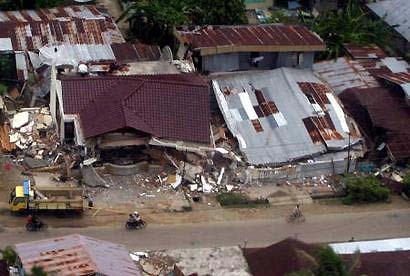 But there were later reports that an entire town which survived the Boxing Day quake - Aceh Singkil, on the south-western coast of Aceh province -had been levelled by the latest quake. Phil Cummins, of Geoscience Australia, said that although no major tsumani had yet been reported near the quake epicentre off Indonesia's Sumatra island, a big tidal surge could still be heading across the Indian Ocean towards Africa. "I would say there is still potential for this to have generated a large tsunami," he said. The earthquake off Indonesia could still produce a tsunami as big as the killer waves which left nearly 300,000 dead following a similar quake in December, seismologists in Australia said today. Australia's bureau of meteorology said a 25cm tsunami had already hit Australia's remote Cocos Island and bigger tidal surges were expected to strike Australia's west coast. 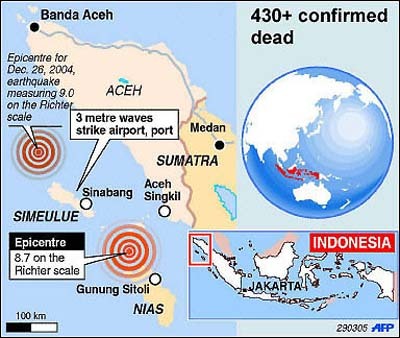 Australia's bureau of meteorology initially reported that the tsunami measured just 10cm at Cocos Island, located in the deep waters of the Indian Ocean south of Sumatra, but later upgraded that to 25cm. "That's fairly big for the deep ocean," Mr Cummins said of the wave which hit Cocos, adding that an alert had been issued for a one metre surge expected to hit the Western Australia coast. Asked if the east coast of Africa could still be struck by a major tsunami from the latest quake, Mr Cummins said: "I would say it's still something we have to regard as a possibility. "We've seen the thing at Cocos Island and that really does tell us we have to exercise caution." According to the latest national poll conducted by the Lowy Institute, only 58 per cent of Australians have "positive feelings" towards the world's superpower, with more than two-thirds complaining that the US holds too much sway over Australian foreign policy. The US ranked BELOW China, France and Japan in the public's estimation. Australians rated the US above only Indonesia and the so-called axis of evil member Iran and its war-torn neighbour Iraq. 72 per cent of Australians would oppose Australia joining a US-led war with China over the independence of Taiwan. 32 per cent of respondents said they were "very worried" about US foreign policies. However, 61 per cent said they still regarded Australian alliance with the US as "very important" to Australia's security. 36 per cent said they were very worried about Islamic fundamentalism. Only 34 per cent thought the US free trade agreement was good for Australia. 51 per cent thought a free trade agreement with China,would be good for Australia. 46 per cent concerned on global warming. Australia is one of Washington's closest allies in the Asia-Pacific region.The 53-year-old U.S.-Australia alliance, or Anzus, is one of Washington's strategic anchors in the Pacific. The results of the comprehensive survey of opinion in a country surprised foreign policy analysts in Australia and underscore the problems facing the Bush administration as it tries to improve the international image of the United States. The survey, the most comprehensive ever conducted on public opinion in Australia on international relations, shows that America trails far behind China and Japan in public popularity. Australia is a predominantly Christian, Anglo-Saxon country. It has a lot of cultural affinities with the United States. Analysts say the historically close relationship, which has seen Australians alongside American soldiers in Korea, Vietnam and the two Gulf wars, has become a harder sell during the Bush Presidency. The poll results are a surprise to many because the American-Australian relationship has long been considered special by political leaders, liberal and conservative, in both countries. "There is quite a big disconnect between how the world views Bush and how the Americans view Bush," says Don Russell, Australia's ambassador to Washington between 1993 and 1995. Although 84 percent of Australians had positive views of Japan and 69 percent expressed positive views of China, only 58 percent felt the same way about the United States. The findings of the opinion poll suggest that one of the main reasons for the lack of popularity of America in Australia is the perceived influence that Washington exercises over Australian foreign policy. The poll found that more than two-thirds of respondents felt "we take too much notice of the views of the United States." 57 percent of Australians rated U.S. policy as a threat equal to Islamic fundamentalism. The severity of the earthquake was upgraded to 8.5 - 8.7 on the Richter scale. 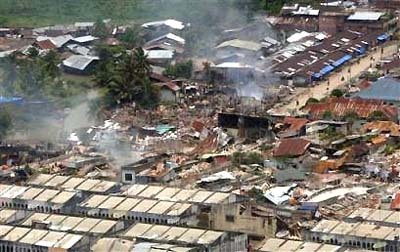 Gunungsitoli, the main town on Nias island, was closest to the epicenter of the quake. Sri Lanka, India and Thailand have all withdrawn tsunami alerts issued after a massive quake off the Indonesian coast. Sri Lankan authorities said it was now unlikely a devastating wave would hit the island. "We have withdrawn the tsunami warning as the time for the wave to strike has lapsed," official P M Jayatilake said. "I think it's safe for people to start going back home," he said. India also withdrew its tsunami alert, telling tens of thousands of people who had fled their coastal homes it was safe to return, an official said. "We have called off the alert for the people. But administration officials have been told to maintain a watch for another few hours. "The people can now go back as the possibility of the danger is now over," S K Swami, a Home Ministry spokesman, said about four hours after the alert was sounded. The 8.7 magnitude quake struck off the Indonesian island on Sumatra about 2.15am (AEST). THIS MESSAGE IS FOR INFORMATION ONLY. THERE IS NO TSUNAMI WARNING OR WATCH IN EFFECT. ALL CLEAR DETERMINATION MUST BE MADE BY LOCAL AUTHORITIES. EXPECT DECREASING WAVE HEIGHTS WHERE OBSERVED. REGIONS OF THE INDIAN OCEAN. "Roughly it is expected between 1000 and 2000 died," he told El Shinta news radio. The 8.7 magnitude quake struck about 2.15am (AEST) today, sparking mass panic amid fears it would cause a new tsunami disaster. "With 80 per cent buildings in Gunungsitoli having been damaged, that could happen," Mr Kalla said of the estimated body count. 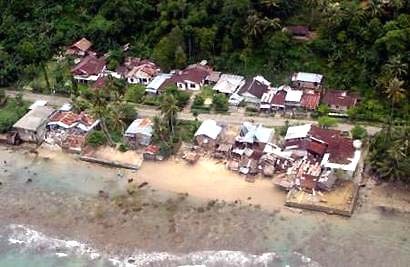 Nias island, is ill-equipped to handle the double-disaster of another huge earthquake on top of last year's devastating tsunami. The Bali-sized land mass, roughly 125 kilometres (77 miles) west of Sumatra, is believed to be the location hardest hit by an earthquake late Monday that measured between 8.5 and 8.7 on the Richter scale. Initial reports from the island say that hundreds of houses have collapsed killing about 300 people and prompting many more to flee for higher ground. Police said power cuts were hampering rescue work. 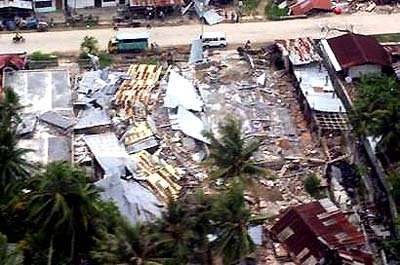 The island of 500,000 people was already struggling to recover from the December 26 tsunami disaster, which claimed relatively few casualties on Nias but caused major damage and left many without homes and food. 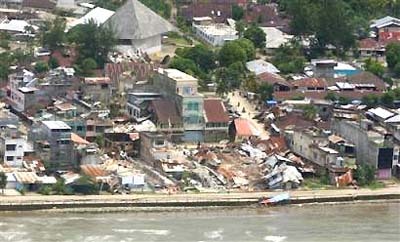 With most of the relief operation in the wake of the December 26 disaster focused on the heavily-populated shorelines of Sumatra's western Aceh province, Nias was awarded less attention, with some aid delayed due to its remoteness.Prior to December 26, Nias had been developing a modest tourist industry, with a reputation as a premium destination for adventurous surfers and scuba divers. The island's southern Lagundi bay is a regular feature of the world professional surfing circuit. A SMALL tsunami sparked by a huge earthquake in Indonesia was making its way down the West Australian coast towards Perth, an Australian seismologist said today. Geoscience Australia expert Mark Leonard said the 23cm tsunami had already hit the Cocos Islands, an Australian territory in the Indian Ocean 2950km northwest of Perth. It was also likely to have reached the North West Cape on the West Australian coast, and would continue to travel south towards Perth, he said. But he suggested major damage from the surge was unlikely, and the wave would be difficult to detect with the naked eye. The United States is moving into "battle mode" following Monday's magnitude 8.7 earthquake in southern Asia, alerting U.S. posts in the region and contacting aid workers, a State Department spokesman said. "We're applying what we've learned from the previous earthquake, so that we can be prepared to be responsive quickly and in a meaningful way," said spokesman Adam Ereli. He said U.S. officials are "in battle mode to be in a position where we can act." At 11.09 pm local time, an earthquake (8.2 Richter scale) struck about 440 km off the west coast of the island of Sumatra, Indonesia, approximately south and south east of Bandar Aceh. US Geological survey experts say the hazard from the earthquake would be "extreme". In the west coast of Malaysia, especially in Penang, the tremors were felt. Some residents felt the tremor stronger than the one felt in December last which caused the tsunami. ALASKA - BRITISH COLUMBIA - WASHINGTON - OREGON - CALIFORNIA. EXISTS TO COASTLINES IN THE PACIFIC. DESTRUCTIVE TSUNAMI IN THE OCEAN OR SEAS NEAR THE EARTHQUAKE. MONITORING TO DETERMINE THE NEED FOR EVACUATION FURTHER AWAY. WITHIN THREE HOURS OF THE EARTHQUAKE. U.S. officials were urging residents to evacuate coastal regions in the Indian Ocean after a earthquake with a preliminary magnitude of 8.2 struck off the coast of Indonesia Monday. The National Oceanic and Atmospheric Administration urged residents within 1,000 kilometers of the epicenter to evacuate coastal regions. The quake was centered on the same fault line where a December 26 earthquake launched a tsunami that killed at least 175,000 people. The director of the Pacific Tsunami Warning Center said scientists there feared another tsunami might hit the area. 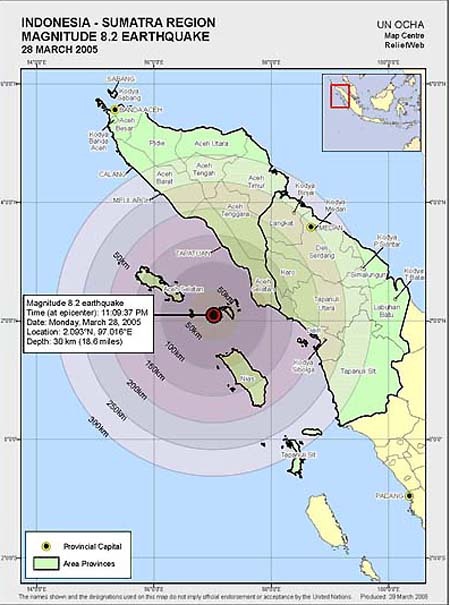 Charles McCreary said he could not be certain that the quake, which was 203 kilometers (126 miles) from Sibolga on Sumatra Island, would cause a tsunami. Experts agreed the quake was massive. "This earthquake has the potential to generate a widely destructive tsunami in the ocean or seas near the earthquake," NOAA said in a statement on its Web site. "Authorities in those regions should be aware of this possibility and take immediate action." Asked whether evacuations are taking place, USGS spokesman Don Blakeman said, "I certainly hope so." Thailand issued a warning that the quake could bring a tsunami to its southern provinces. The warning, which was carried on national television, cautioned people in the six provinces to be careful and vigilant, but did not order evacuations. USGS spokesman Doug Blake said there had been no reports of tsunami activity nearly 90 minutes after the quake struck. "We're still waiting for any kind of reports," he said. "At this point in time we don't know what type of fault occurred ... and that is critical information we just don't have yet," he said. "It is in the aftershock zone of the December 26 quake. It's a little bit south, but it's on the same fault." The quake occurred at 11:09 a.m. ET (1609 GMT), and is considered a "great" earthquake, the largest of seven grades. The grades are very minor, minor, light, moderate, strong, major and great. One way of manipulating public opinion away from any negative thoughts that the Bush administration messed up by invading Iraq is to promote Paul D. Wolfowitz, deputy secretary of defense, one of the leading architects of the weapons-of-mass-destruction theory. Make him President of the World Bank. Not only are you not admitting a mistake, you're daring the American public to think otherwise. The stunning selection of hard-liner John Bolton as the U.S. representative to the United Nations, an organization he has openly disdained. The nomination of Condoleezza Rice as secretary of state. Wolfowitz -- the principal architect of the U.S. invasion of Iraq -- has been wrong so many times that it's a wonder he is still in office. It's simply astonishing that he's up for a big promotion. But if Wolfowitz had been put out to pasture or given a second-tier post in the second term, the public would have interpreted such a step as a quiet way of getting a policy embarrassment out of sight. How to foil such a perception? Promote the heck out of him. Make him more prominent than ever. There's a note of presidential in-your-face defiance here. Forget the awkward absence of weapons of mass destruction or the zero links between Saddam Hussein and the 9-11 terrorist attacks. Reality is as the administration defines it. And that's how Wolfowitz got this plum reward at the World Bank. Wolfowitz, the No. 2 civilian at the Pentagon, told Gen. Eric Shinseki, the former Army chief of staff, that he was "wildly off the mark" when he told Congress a month before the invasion that the United States would need at least 200,000 occupation troops in Iraq. For speaking truth to power, Shinseki was eased out of his Pentagon job ahead of his scheduled departure. To drive the point home, none of the top Pentagon civilians had the grace to attend his formal retirement ceremony. There are some 150,000 American forces in Iraq, scores of whom have been redeployed there two and three times. Wolfowitz also is known for falsely forecasting a jubilant welcome for the American invaders. Iraqis would shower them with bouquets of flowers and greet them as liberators. He also predicted those Iraqi oil revenues would more than pay for the costs of war and reconstruction. When asked why the Bush administration hyped the nonexistent threat of Saddam's weapons of mass destruction, Wolfowitz admitted that the WMD script was chosen because it was the most saleable argument to persuade the American people to support the war. The Wolfowitz appointment to head the World Bank was a downer for a number of the 184 member nations of the bank and its career staff. His reputation had preceded him. Joseph Stiglitz, former chief economist at the bank and a Nobel laureate, opposes the Wolfowitz nomination on grounds that Wolfowitz could make the bank "an explicit instrument of U.S. foreign policy." But the major European nations appear resigned to the controversial appointment. After all, the bank is traditionally headed by an American. The World Bank is the main lender to poor countries to help fight poverty and disease. Wolfowitz said he supports the bank's "noble mission." The bank appointment of a high Pentagon personage follows the career path of former Defense Secretary Robert McNamara, who moved from Lyndon B. Johnson's Cabinet to the World Bank after he developed second thoughts about the wisdom of the Vietnam War. McNamara served as the World Bank president from 1968 to 1981 and focused on reducing poverty. I saw a very distraught McNamara leave the Johnson inner circle. Johnson -- who was not prepared to brook McNamara's newfound anti-war sentiments -- was happy to see him go. Since he left the Pentagon, McNamara has spent a lot of time revealing his remorse over the mistakes and miscalculations about the Vietnam War. I'll wager we won't be getting any apologies or confessions of mistakes about Iraq from Wolfowitz down the road. For the uninitiated, AIPAC, stands for American Israel Public Affairs Committee. The word in Washington has been that AIPAC has a "fly on the wall" that either relays or listens in to discussions on all matters to do with US's foreign policy in the Middle East. It has tentacles influencing by proxy Middle East policies of other countries such as UK and Australia.
" AIPAC is considered one of the five most powerful lobbies in Washington, alongside giants like the American Association of Retired Persons and the National Rifle Association. Another proof of its power is the presence at the main banquet of its annual policy conference of senior U.S. politicians. Last year, about half the Senate and one-third of the Congress was at the banquet, alongside governors and dozens of other politicians. Not many other organizations can put on such a display." On its website, AIPAC boasts "...The New York Times has called AIPAC the most important organization affecting America's relationship with Israel, while Fortune magazine has consistently ranked AIPAC among America's most powerful interest groups. " "AIPAC has 65,000 members across all 50 states who are at the forefront of the most vexing issues facing Israel today: stopping Iran from acquiring nuclear weapons, fighting terrorism and achieving peace. And above all, ensuring that Israel is strong enough to meet these challenges. Through more than 2,000 meetings with members of Congress - at home and in Washington - AIPAC activists help pass more than 100 pro-Israel legislative initiatives a year. From procuring nearly $3 billion in aid critical to Israel's security, to funding joint U.S.-Israeli efforts to build a defense against unconventional weapons, AIPAC members are involved in the most crucial issues facing Israel. Activists work closely with AIPAC's professional staff, people drawn from the top echelons of government, diplomacy, academia and politics. AIPAC lobbyists meet every member of Congress and cover every hearing on Capitol Hill that touches on the U.S.-Israel relationship. AIPAC policy experts each day review hundreds of periodicals, journals, speeches and reports and meet regularly with the most innovative foreign policy thinkers in order to track and analyze events and trends." AIPAC's influence on US foreign policy was becoming too strong for many Americans' liking. The Washington Report on Middle East Affairs (WRMEA) keeps track on AIPAC's contribution to US Congressional candidates. Read here WRMEA's "U.S. Financial Aid To Israel: Figures, Facts, and Impact"
AIPAC's strength comes from the pervasive American Jewish influence in American political, social and cultural landscapes. No one, least of all the US mainstream media, for fear of retribution, political and career-wise, wants to talk about the power of the Jewish lobby in Washington, even if its influence on US foreign policies borders on endangering US national interests and lives of Americans in uniform.
" Remaking the American power structure without Jews is like remaking sports without blacks. At least when it comes to blacks in sports, you can talk about it; you can say that blacks changed sports. But no one is allowed to speak up about something we all quietly know: Jews changed America. Psychologically attuned Jews and Hollywood Jews changed the language of popular culture -- Seinfeld, Weinstein.... I have not even gotten to finance or the law, though anyone who doubts the Jewish influence here should ask how many white-shoe law firms still keep gentlemen’s hours. I’d go further and argue that the greatly diminished influence of church on public mores wouldn’t have happened without secularized Jews gaining cultural power. And no one ever talks about it. If you talk about Jewish influence, you’re risking a Holocaust. So there’s no public acknowledgment of something almost everyone understands: Jews are MAJOR players in the establishment. There are so many Jews in the media that the cone of silence falls over the territory where you might expect wider discussion. The establishment tends to be portrayed as a kind of bland rainbow of excellence—all welcome, Jews, suburbanites, Asians, Hispanics. By the way, I don’t claim to know how Jewish the membership of the establishment is. Twenty percent, 50 percent? I’m guessing 30. There’s nothing wrong with an elite. Society couldn’t operate without one. But a democracy demands some accountability of these elites." "Indeed, more and more prominent American Jews who were once committed to Zionism have altered their views. '...here we are, probably the most learned, most affluent, most politically powerful Jewish community in the history of the world, and we are tied in knots about who we are. The public domain of our institutions and the popular Jewish press has been colonized by the most right-wing element of our community. Israel is a problem for me because it claims to speak for the Jewish community, and the Jews who speak for it confound and subvert that Judaism that I love and teach—the Judaism that can contribute to creating a better and more just world." While Jewish organizations place Israel—and support for the Sharon government—at the “center” of their agenda, for the vast majority of American Jews Israel remains a largely peripheral interest. Indeed, those who are proclaimed—and proclaim themselves—“Jewish leaders” may speak for a very small constituency, largely themselves." The fundamentalist Christian Right in the US gave added strength to the Pro-Israel Jewish lobby.
" In recent years, a politicized and right-wing Protestant fundamentalist movement has emerged as a major factor in US support for the policies of the rightist Likud government in Israel. The (Christian Right) fundamentalist leader Gary Bauer, for example, now receives frequent invitations to address mainstream Jewish organizations. Former prime minister Benjamin Netanyahu noted, "We have no greater friends and allies" than right-wing American Christians." Within the Bush administration, the neo-conservatives (neocons) are pushing the same agenda as AIPAC.
" 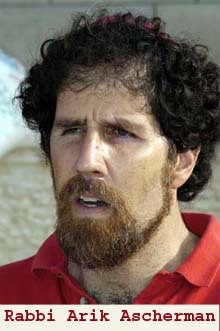 The link between active promoters of Israeli interests and policymaking circles is stronger by several orders of magnitude in the Bush administration, which is peppered with people who have long records of activism on behalf of Israel in the United States, of policy advocacy in Israel, and of promoting an agenda for Israel often at odds with existing U.S. policy. These people, who can fairly be called Israeli loyalists, are now at all levels of government, from desk officers at the Defense Department to the deputy secretary level at both State and Defense, as well as on the National Security Council staff and in the vice president's office. Pro-Israel activists with close links to the administration are also busy in the information arena inside and outside government. The head of Radio Liberty, a Cold War propaganda holdover now converted to service in the "war on terror," is Thomas Dine, who was the very active head of AIPAC throughout most of the Reagan and the Bush-41 administrations. The incestuous nature of the proliferating boards and think tanks, whose membership lists are more or less identical and totally interchangeable, is frighteningly insidious. ... Probably the most important organization, in terms of its influence on Bush administration policy formulation, is the Jewish Institute for National Security Affairs (JINSA). The dual loyalists in the Bush administration have given added impetus to the growth of a messianic strain of Christian fundamentalism that has allied itself with Israel in preparation for the so-called End of Days." There is another powerful Pro-Israel lobby group that acts as a Washington think-tank. It calls itself "Washington Institute for Near East Policy (WINEP)". "The Washington Institute for Near East Policy (WINEP), established in 1985, soon became the most influential think tank with effects on the United States government's Middle East policy and US mass media reporting about the region. The institute's founding director, Martin Indyk, was previously Research Director of the leading pro-Israel lobby, the American Israel Public Affairs Committee (AIPAC ). In contrast to AIPAC's partisan image, Indyk successfully positioned Winep as an organisation that was "friendly to Israel but doing credible research on the Middle East in a realistic and balanced way" (1). As Indyk had been raised and educated in Australia, he had to be quickly naturalised as a US citizen in order to join the Clinton administration. Later he served as US ambassador to Israel, assistant secretary of state for Near Eastern affairs, and then did a second tour as ambassador to Israel.". While AIPAC targets Congress through the massive election campaign contributions that it coordinates and directs, WINEP concentrates on influencing the media and the executive branch. To this purpose it offers weekly lunches with guest speakers, written policy briefs, and "expert" guests for radio and television talk shows. Since the outbreak of the current intifada, WINEP's previous "moderate" Zionist outlook has been marginalised in Israeli political discourse. WINEP's rightward drift is also in accord with the anti-Arab and anti-Muslim sentiment that has proliferated in post-11 September US thought and culture. Its new political stance ensures that WINEP will have access to the Bush administration, even if its affiliates do not comprise the inner circle of Middle East policymakers as they did in the Bush Sr and Clinton days." Has the Pro-Israel Lobby in the US crossed the line between looking after Israel's interest and endangering US national interest and American lives, notably, the lives of the men and women in the US military? The voices of concern are getting louder. Coming in Part Two . Arik Ascherman, an American-born rabbi, has spent years planting himself atop doomed Palestinian homes, reading extracts of international law to Israeli forces as they demolish the buildings beneath his feet. 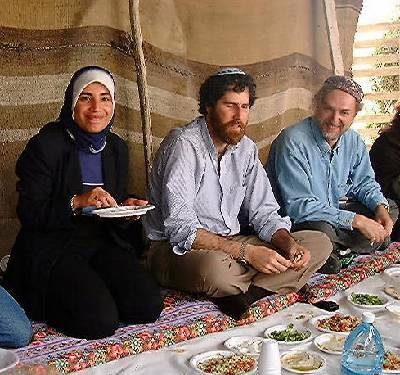 More recently, Rabbi Ascherman, with a knitted blue skull cap pinned to his woolly black hair, has been at the forefront of resistance to the construction of what Israel calls its "security barrier" penning in and carving up West Bank villages. Along the way he has been a persistent embarrassment to the Israeli government as a fervent Zionist who claims to reflect the true soul of the Jewish state by resisting its oppression of Palestinians. He has been arrested many times but this week, for the first time, the 45-year-old director of Rabbis for Human Rights was convicted for his form of resistance. The prosecution has asked the court to sentence Rabbi Ascherman to do community service after he was convicted of obstructing the demolition of illegally built Arab homes in East Jerusalem by standing in front of the bulldozers. It is a dangerous business; an American peace activist, Rachel Corrie, was killed doing the same in the Gaza Strip. The trial judge would not permit Rabbi Ascherman to present evidence about the context of his actions, which he says are motivated by opposition to "clear discrimination" that is illegal and immoral. "The way to be pro-Israel is to work for a better Israel, and the real Zionism is to work for an Israel that is not only physically strong but morally strong. There is a false equation that if you voice any criticism of Israel you are delegitimising Israel at some level. I believe the opposite. The families were hysterical. The grandmother was wailing while the father of the family was clutching at his heart and others were begging us to do something. It was simply heartbreaking. To officer after officer I read off chapter and verse from various international conventions which Israel is a party to. Commanders ordered their people not to listen or take the paper. Nobody says to the Palestinians outright that we're not going to give you a permit because you're a Palestinian but there is a policy of exactly that. It reinforces my belief that this is a country fighting for its soul, that Zionism is fighting for its soul, that Judaism is fighting for its soul. Nothing, even after the terrible things I've seen, causes me to call the enterprise into question. But as a Jew, as a rabbi, as an Israeli, as a Zionist, I've always wanted to believe that we're better. I don't think we're any worse, but I can't any more say that we're better. It only reinforces my commitment to save the soul of Judaism. I began to define myself as a Zionist after reading a view of Zionism as a liberation movement of the Jewish people. I came to work here knowing there were issues of discrimination against Israeli Arabs but there was always a difference between what you know on a theoretical level and what you experience. And what I experienced in those years is not as horrific as some of the things we've seen in the occupied territories. In 1998, the government was demolishing one or two Palestinian homes each day. But then the government changed its policy as a direct result of the work we had done." The Israeli human rights organisation B'Tselem estimates the authorities have demolished the homes of more than 16,000 Palestinians over the past 18 years for building illegally (separate from the mass demolitions in the Gaza Strip on "security" grounds). Israel maintains that any government is entitled to tear down buildings constructed without planning permission. But since the Israeli army occupied East Jerusalem in 1967, the government's policy has been to contain the growth of the Arab population by refusing building permits while confiscating Palestinian-owned land to build sprawling Jewish neighbourhoods in the city. He says he wanted to be a rabbi from an early age while growing up in Pennsylvania, and later came to Zionism. But it was not until he visited Israel in 1982 and spent 18 months as a community worker in an Arab village that he began to appreciate some of the costs of Zionism to others. The Harvard-educated rabbi adheres to the teachings of the Jewish theologian Abraham Joshua Heschel: "He wrote that only a few are guilty but we are all responsible." That philosophy led him into regular confrontation with the government over what he calls the "enormity of the injustice" of house demolitions, the confiscation of Palestinian land and the destruction of their olive groves. When he returned to Israel in 1994,he married Einat Ramon, the first Israeli-born woman to be ordained as a rabbi. 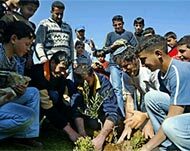 Recent protests have also focused on the construction of the vast steel and concrete barrier through the West Bank because it seals off Palestinian villages and expropriates their land. The rabbi was arrested when he objected to the Israeli security forces tying a Palestinian to the front of a jeep as a human shield against stone throwers. On other occasions he has been attacked by club-wielding Jewish settlers. Rabbi Ascherman's first protest also became one of the most celebrated. 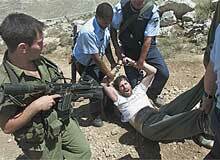 He attempted to defend the home of Saleem Shawarmah, built in the West Bank village of Anata and demolished in 1998. He helped rebuild the house. A few days after it was complete, the army demolished it again. It was rebuilt in 1999, and then bulldozed. The ensuing public attention led to a dramatic decline in demolitions for a few years. That success started to crumble with the onset of the second intifada in the autumn of 2000 and house demolitions surged again. None of this has caused Rabbi Ascherman to question his Zionism, but it has changed his view of the Jewish state's claim to moral superiority and the "purity of arms" of its military. This site contains copyrighted materials the use of which has not always been specifically authorized by the copyright owner. The copyrighted materials are used under the "fair use" provisions for purposes of advancing awareness and understanding of social justice, political, human rights, economic issues, etc. The "fair use" provision is as stipulated in section 107 of the US Copyright Law. In accordance with Title 17 U.S.C. Section 107, the materials on this site are distributed without profit to those who have expressed a prior interest in receiving them for research and educational purposes. Please go to http://www.law.cornell.edu/uscode/17/107.shtml for more information. Readers must obtain permission from the copyright owner if they choose to use these materials beyond the "fair use" provisions.